WASHINGTON -- U.S. officials Friday announced plans to spend $325 million on two new supercomputers, one of which may eventually be built to support speeds of up to 300 petaflops, faster than any supercomputer running today. The funding was announced at a press conference at the U.S. Capitol attended by lawmakers from both parties. But the lawmakers weren't reading from the same script as U.S. Energy Secretary Ernest Moniz when it came to assessing the U.S.'s place in the supercomputing world. But Rep. Chuck Fleischmann (R-Tenn.) put U.S. leadership in the past tense. "Supercomputing is one of those things that we can step up and lead the world again," he said. The Oak Ridge lab is located in his state. And Rep. Dan Lipinski (D-Ill.), whose state is home to the Argonne National Laboratory, said the U.S. lead "is being challenged by other countries," and pointed out that the U.S. has dropped from having 291 supercomputers in the Top500 list to 233. "Our technology lead is not assured," said Rep. Bill Foster (D-Ill.), who lamented the movement of computer chip manufacturing to overseas locales. The U.S. leads the world in supercomputing in terms of the dominance of its vendors, research capability and, as Lipinski pointed out, overall number of systems in the top 500, but not in speed. The new system to be built at Oak Ridge will be called the Summit. 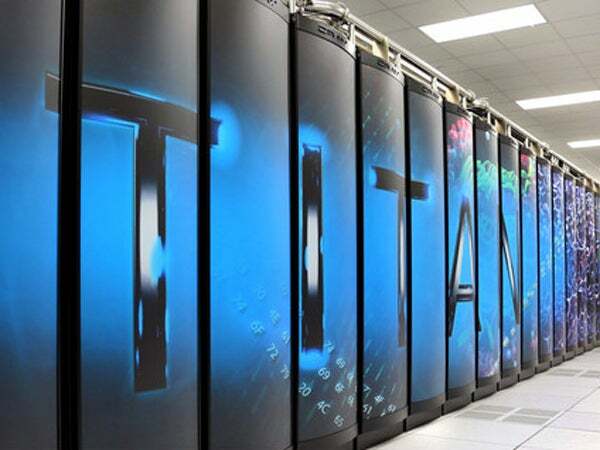 It will use about 10 megawatts of power, which is close to the power usage of Oak Ridge's existing supercomputer, the Titan, which is ranked No. 2 in the world. The Summit will run five times faster than the Titan, despite using the same amount of power. The new system to be built at the Lawrence Livermore lab in California will be known as Sierra. These systems will use IBM Power CPUs and Nvidia's Volta GPU, the name of a chip still in development. Bill Dally, chief scientist at Nvidia, said in an interview that the GPUs will provide 90% of the compute capability on the new DOE machines. The improvement in power efficiency involved getting rid of overhead, including logic operations not directly involved with computation. Nvidia also looked at the data movement and focused on architectures to improve efficiency, such as colocating processes and minimizing the distance the data has to move. Dally said chip efficiency will have to improve by a factor of 10 to get to exascale performance levels, but he believes that's possible with this architecture. "We have enough things on our target list," he said, referring to possible changes in the chip design. Moniz said supercomputing leadership is not only about the speed of the computer, but also about the way one matches and integrates that with the algorithms and software. Pointing out that, in that area, the U.S. has the deepest experience, he vowed, "We will sustain that leadership."